I’ve arrived early at Fenway for Game 1 of the World Series. Eric Hjerpe, my business partner, and I are meeting up for dinner and the game. I feel incredibly blessed right now. 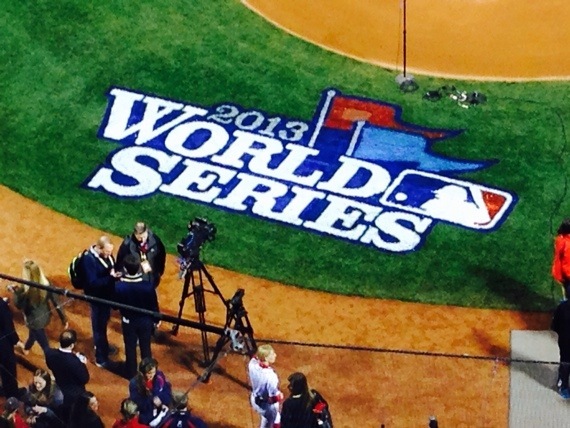 I’ve always dreamed of having season tickets and then going to the World Series. It is something many boys and girls think about. So, tonight is the fulfillment of an immigrant boy’s dream. I also think this year’s team is special and comes at a special time. I wrote previously about the Boston Marathon bombings, and how one of my children and I were at Fenway on that day. I wrote about the ensuing lockdown during the manhunt and the tremendous joy in the streets that night after the last bomber was apprehended. The players fanned out to visit the hospitals on precious days off, away from the eye of the media They really gave back. So, I do want the team to win the World Series, but honestly, I want that most of all for the players. Not the fans, not the owners. I want this squad to win because they’re awesome people. You may have heard about “Boston Strong.” It is around the park and has been mowed into center field. If you’re not from around here, it may seem hokey. It is, but it works.